This was some sort of sedum that grew in my front yard, late in the summer. It was now gone like everything else in my world right now. Most living things are on hiatus for the next few months. Luckily, I still have a hard drive full of photos to share :-) and it won't be a boring winter at all. It will be another interesting year as the weather is on an odd side of normal at the moment. What is normal you might ask when it comes to weather? Nothing, I suppose, but I just know that it is so wet here these past few weeks. We barely have dried weather to do the clean up in our yard. I am still enjoying my "summer". What a lovely post for the day -- as always! Love your mosaic and particularly the beautiful background sky in the center pic! Hope you have a great week! Gorgeous flowers, the colors are beautiful. Lovely mosaic. Hope you have a happy week ahead. This is a very lovely mosaic! Lovely collage- i like the way you have featured the orange image in the centre. The collage so well created. Love the compositions. Winter too brings in its own beauty. Dobrze, że masz dużo zdjęć do pokazania, jak będzie nie ciekawa pora roku. Mozaika jest śliczna. Pozdrawiam. Well, they have a lot of photos to show how it will not be an interesting season. Mosaic is beautiful. Yours. Gorgeous collage. 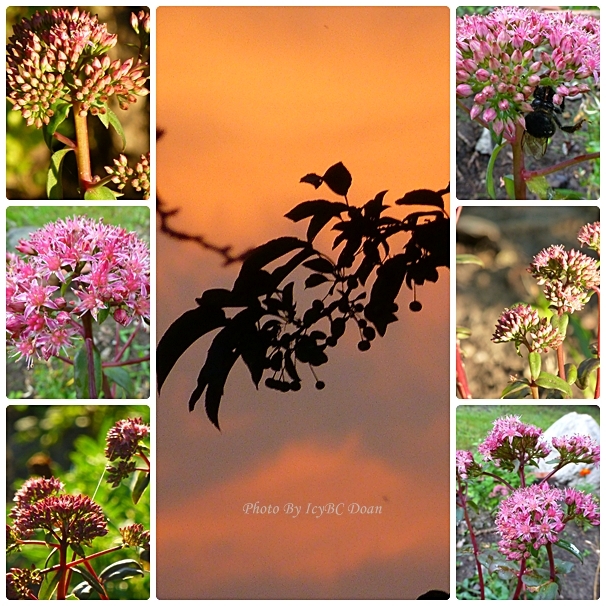 The sedum are lovely. when i read about the weather there, it makes me grateful for having summer all year round. hehehe! Hurricane Sandy certainly created a stir, so I have to agree with you in your query - What is normal for weather?